Thread: Bharat Main Poster Gets Leaked: Salman Khan’s 4 Looks & A Beautiful Katrina Kaif! Bharat posters are becoming a daily routine for a couple of days now. The makers are revealing various looks of Salman Khan and today they gifted us with Katrina Kaif’s look too. We didn’t see that coming but it’s been a roller-coaster ride with the promotional assets of this film.But as every big film is nowadays becoming a victim of leaks, Bharat is the fresh target of it. Yesterday we saw a huge chunk of Avengers: Endgame leaking on the net. Directors Russo brothers also appealed digitally to not spread any spoilers around the net. Bharat Main Poster Gets Leaked: Salman Khan’s 4 Looks & A Beautiful Katrina Kaif!With, Bharat it’s the main poster that has been leaked. 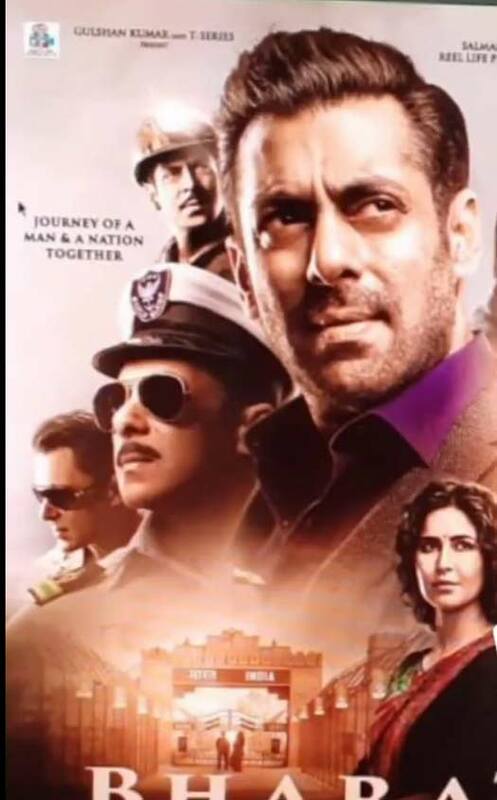 In the poster, we can see 4 looks of Salman Khan along with Katrina Kaif shining with curls. The poster is a cropped image and we are assuming the fifth look is the 2010’s salt-and-pepper one which was the first look poster released of Salman.Yesterday soon after the Dabangg star shared a new poster of his upcoming film Bharat, in which he features in a younger avatar, Hilton posted a “cool” emoticon on it. “Jawaani humari jaaneman thi! Bharat ki jawaani,” Salman had captioned the look, which reminded his fans of his looks in the 1990s.Directed by Ali Abbas Zafar, “Bharat” is an official adaptation of a 2014 South Korean film “Ode To My Father”. It is produced by Atul Agnihotri’s Reel Life Production Pvt Ltd and Bhushan Kumar’s T-Series. The film also stars Katrina Kaif, Disha Patani, Tabu and Nora Fatehi, among others. It is slated for an Eid release.Salman on Wednesday introduced Katrina’s character with a poster, saying: “Aur phir humaare zindagi mein aayi ‘Madam Sir’.”Android & IOS users, download our mobile app for faster than ever Bollywood & Box Office updates! Bharat: Is This Katrina Kaif’s Look In The Salman Khan Starrer?